As I awoke from my Thanksgiving food and alcohol coma, I realized that my relatives did not take my subtle hint to heart and will be staying with us through the remainder of the weekend. As a result and much to my liver’s chagrin, a Bloody Mary and butter and onion sandwich will be a good starter for what will likely be a very long and tiresome weekend…..thank God for booze, college football and Sheriff Buford T. Justice. With mounds of leftover turkey and plenty of relatives to feed, I have decided to pull out an old standby. If you recall from Exception To The Rule, rotisserie chicken is a great shortcut for my tortilla soup. That being the case, wouldn’t leftover fried turkey make it that much better……. In a large stock pot, heat oil over medium-high. Add chopped onions and jalapeno, sautéing for 3 minutes. Add tomatoes, garlic, chipotle and adobo sauce, sautéing for another 5 to 7 minutes. Once the juice from the tomatoes has evaporated, add chicken broth, bay leaves, hominy and cilantro. Bring ingredients to a boil and reduce heat to medium. Simmer for approximately 30 minutes, adding more chicken broth, beer or water if needed. Just prior to serving, add the turkey to the pot to warm. Garnish with cilantro, Monterey Jack cheese, sour cream, avocado and/or purple onion. * Sazon is a mexican soup seasoning made by Goya. There are several different flavor combinations. I use the one with coriander and annatto. Twisted Epilogue: BTW, don’t knock if you haven’t tried it. Butter and onion on white bread is a damn good hangover cure. Courtesy of the late, great Joe Bob Hille! 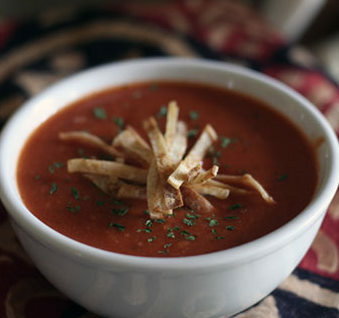 This entry was posted on Friday, November 25th, 2011 at 2:41 pm	and tagged with Leftovers, Soup, Tex-Mex, Tortilla Soup Recipe, Turkey and posted in Main Dishes, TexMex. You can follow any responses to this entry through the RSS 2.0 feed. It is a family favorite. When you try it out, let me know what you think.